(1975) "Fanny (Be Tender with My Love)"
"Nights on Broadway" is a song by the Bee Gees from the Main Course album released in 1975. The second single released from the album, it immediately followed their number-one hit "Jive Talkin'". This track was credited to Barry, Robin and Maurice Gibb. Recording this track started on 20 January 1975 and continued on 30 January, when they started to record songs for the album: "Jive Talkin'" (finished 2 February), "Songbird", "Fanny (Be Tender with My Love)" (finished 19 February), "All This Making Love" and "Edge of the Universe". "It came to me in a dream, there was a request by Arif Mardin, who was like an uncle to us, he was a great record producer during the song 'Nights On Broadway,' for the Main Course album, which is previous to the 'Fever' syndrome. And he said, 'Can any of you scream, scream in falsetto.' So, you know, give us an ad lib or a scream at the end. So from screaming, it turned into things like blaming it all." Producer Arif Mardin asked if one of the Bee Gees members could do some screaming during the main chorus to make the song more exciting. In response, Barry Gibb began singing higher and higher, eventually singing it in a falsetto that was unexpectedly powerful. He had never known he had such an ability and Barry's falsetto became a trademark of the Bee Gees, although Maurice had been harmonizing in falsetto for years. Barry recalled in a May 2001 interview with Mojo magazine "Arif said to me, 'Can you scream?' I said, 'under certain circumstances'. He said, 'Can you scream in tune?' I said, 'well, I'll try' ". 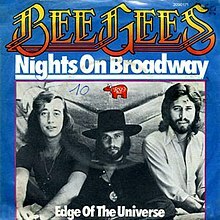 "Nights on Broadway" reached number seven on the American Billboard Hot 100 singles chart, giving the Bee Gees back-to-back top 10 hits for the first time in seven years since 1968. "Nights on Broadway" was edited for the radio, removing the slow section, and fades at 2:52. The version of this song on Tales from the Brothers Gibb was faster than the album, and fades at 4:25. In 1977, Candi Staton released a version of this song that peaked at no. 6 on the United Kingdom Singles Chart in late Summer of that year and at no. 4 in Ireland. It omitted the slow-paced middle-eight which broke up the tempo of the Bee Gees' original. In 1998, the song was sampled on the DMX track "The Convo" from the album It's Dark and Hell Is Hot. In 2008, the song was sampled by hip hop producer Jake One for his song How We Ride for his album White Van Music. ^ a b Brennan, Joseph. "Gibb Songs : 1975". Columbia University. Retrieved 2 February 2014. ^ a b "Nights on Broadway by Bee Gees". Songfacts. Retrieved 20 April 2007. ^ "Forum – ARIA Charts: Special Occasion Charts – CHART POSITIONS PRE 1989". Australian-charts.com. Hung Medien. Retrieved 2 February 2014. ^ "Ultratop.be – Bee Gees – Nights On Broadway" (in Dutch). Ultratop 50. Retrieved 14 July 2013. ^ "Top RPM Singles: Issue 4043a." RPM. Library and Archives Canada. Retrieved 14 July 2013. ^ "Nederlandse Top 40 – Bee Gees - Nights On Broadway" (in Dutch). Dutch Top 40. Retrieved 14 July 2013. ^ "Dutchcharts.nl – Bee Gees – Nights On Broadway" (in Dutch). Single Top 100. Retrieved 14 July 2013. ^ "Charts.nz – Bee Gees – Nights On Broadway". Top 40 Singles. Retrieved 14 July 2013. ^ "Main Course – Awards". AllMusic. All Media Network. Retrieved 14 July 2013. ^ "CASH BOX Top 100 Singles – Week ending DECEMBER 6, 1975". Cash Box. Archived from the original on 3 October 2012. ^ "The Singles Chart" (PDF). Record World. 6 December 1975. p. 31. ISSN 0034-1622. Retrieved 17 September 2017. ^ "Offiziellecharts.de – Bee Gees – Nights On Broadway". GfK Entertainment Charts. Retrieved 20 February 2019. ^ "Top Singles – Volume 24, No. 14, December 27, 1975". RPM. Library and Archives Canada. Retrieved 2 February 2014. ^ "Jaaroverzichten – Single 1975" (in Dutch). Single Top 100. Hung Medien. Retrieved 2 February 2014. ^ "The CASH BOX Year-End Charts: 1975". Archived from the original on 19 August 2012. . Cash Box. ^ "1977 Top 40 Official UK Singles Archive – 3rd September 1977". Official Charts Company. Retrieved 14 July 2013. ^ "The Irish Charts – All there is to know". Irishcharts.ie. Retrieved 14 July 2013. ^ "DMX's The Convo sample of Bee Gees's Nights on Broadway". WhoSampled. Retrieved 14 July 2013. ^ "Jake One feat. Freeway's How We Ride sample of Bee Gees's Nights on Broadway". WhoSampled. Retrieved 14 July 2013. This page was last edited on 5 April 2019, at 03:12 (UTC).